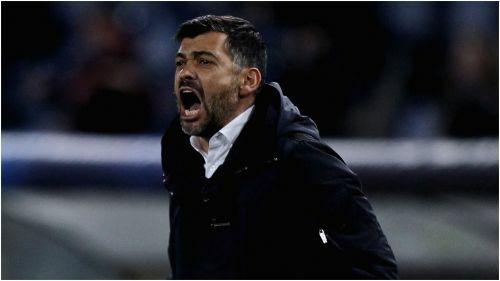 Sergio Conceicao insists he has had no difficulty lifting his Porto players from the weekend's defeat to Benfica as they prepare for the visit of Roma. Porto were beaten 2-1 at home by title rivals Benfica on Saturday, slipping to second place in the Primeira Liga, but they have little time to lick their wounds. The Portuguese side welcome Roma on Wednesday as they look to overturn a 2-1 first-leg deficit and qualify for the Champions League quarter-finals. Such is the scale of the task that Conceicao says there has been very little work required to motivate the squad. "It has not been necessary to give messages or find words inside so that the players know that this game is key," he told a news conference. "There is no greater motivation than the quarter-finals of the Champions League. "We will have a full house, but it is not only the fans who can help us, we also have to help them. We have to do something so that the fans feel that the team has everything to win the game." Roma, like Porto, lost a crunch clash at the weekend as rivals Lazio celebrated victory at the Stadio Olimpico, with Conceicao acknowledging common ground with under-fire Giallorossi boss Eusebio Di Francesco. "Since the last game, the response of all the players has been excellent," he said. "But I'm also in trouble [like Di Francesco] because I lost. "There is no reason why our opponents might be more fragile - all coaches are on the tightrope as results are so important." Commenting on media discussion of Porto's third league defeat of the season, Conceicao only added: "It amazes me what has been said." Yet even as Porto look to move on from a damaging loss, their coach is keen to reiterate that a patient approach will be required to secure an aggregate success. "We need to win the game, but not in a hurry," he said. "We have to be at a good level defensively; Roma have the third best attack in Serie A and good players. "But balance will be essential to get the win. The collective is what counts. Our confidence comes from our work every day, not from any individual player. "Having these players is important, but it's not always decisive. We need to be effective in attack, but also in defence."